We celebrated Winter Solstice with some wonderful food and drinks. 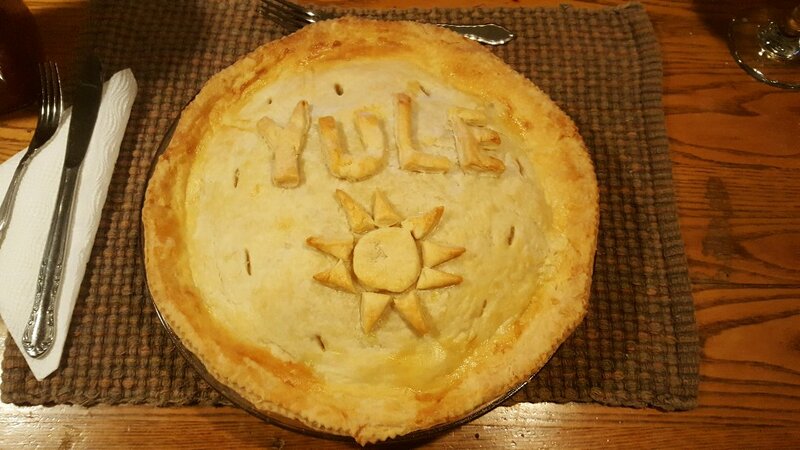 A traditional Yuletide meal in Quebec is the tourtière (tour-tee-air). It is basically a meat pie. It is not easy to reproduce but I got lucky and found a wonderful recipe called Tourtière de Grand-Maman. I translated it and posted it on my recipe page Grandma's Tourtière. It was pretty darn close to the authentic stuff! With mashed potatoes and my Homemade (sweet) Ketchup, this was such a wonderful meal! 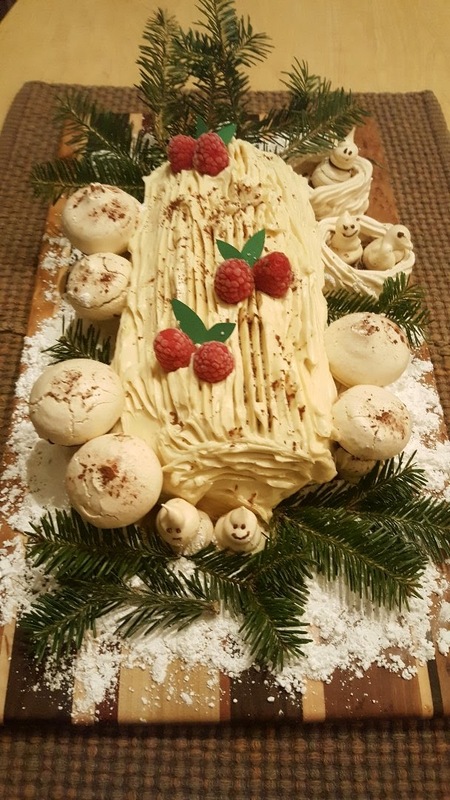 My Yule Log Cake...my pride and joy...FIVE hours of prep! Check out my "snowmen" lol...they look like ghosts, but you get the idea! Alex and I made this cake together, it was such a great afternoon! 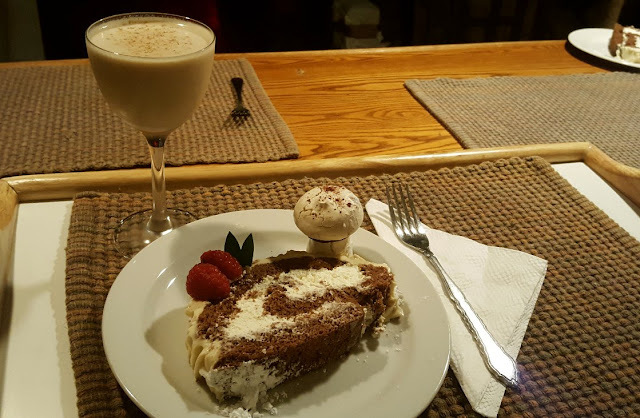 For dessert (after a good long walk and a few hours digesting the meat pie) we had our cake with a Brandy Alexander. Oh my oh my...this little cocktail is SO GOOD...it was the first time we've made it and it had a bit of an egg nog thang about it! Loved it! Every Winter Solstice night, I light my ice lanterns. It's something I've been doing for years! The lanterns are made by filling up balloons with water then freezing them. I made five of them, but one broke apart. Three of them remained intact and the fourth had the top broken off, which I kind of like as I look at the photo! Alex and I sat outside and just enjoyed the moment. Trust me, it was a moment, at -26 on Yule night...eek...we didn't stay out long! Look at me! :) I made a Christmas hat!! This idea was so spur of the moment. I wanted to look the part when we went out to light the ice lanterns...I'm still wondering where I found this free time! I probably won't blog again until after Christmas so I want to wish all of my Blogger friends the happiest and merriest of days! Merry Christmas, you are all so special to me! xoxox!! oh Rain your Yule log is a masterpiece, you should be proud,, it is amazing!! We ate meat pie same as yours,, Canadian eh' lol,, we in ONtario you in Quebec ( I think ) lol,,you asked on my blog if I did all that before sun up, I did not lol, I have been working on the sock monkeys for a few days, the cookie batter i mixed up last night, then baked this morning,, I wish the best the season can bring to you and your fella,, its such an inspiration to read that although Christmas has not been happy for you in the past that you now have found Christmas through new eyes in your wonderful partner, thats true love! Merry Christmas and a Happy New Year to you my friend! Thank you Laurie!!! :)) Yes, I'm still in Quebec (for now! )...about 3 hours north of Montreal in the Laurentians. The meat pies are so delicious with that ketchup, but very filling! I remember only having them around the Christmas holidays. I'm so glad I found a good recipe because I've tried to make one for a few years now and it wasn't very authentic. This year I had a winner!! Your food looks absolutely delicious! Merry Christmas to you and Alex! Thank you Christine!!! :) Come on over! :) Marry Christmas! Wow Rain. Your food always looks like it just came off the pages of Southern Living or Family Circle. 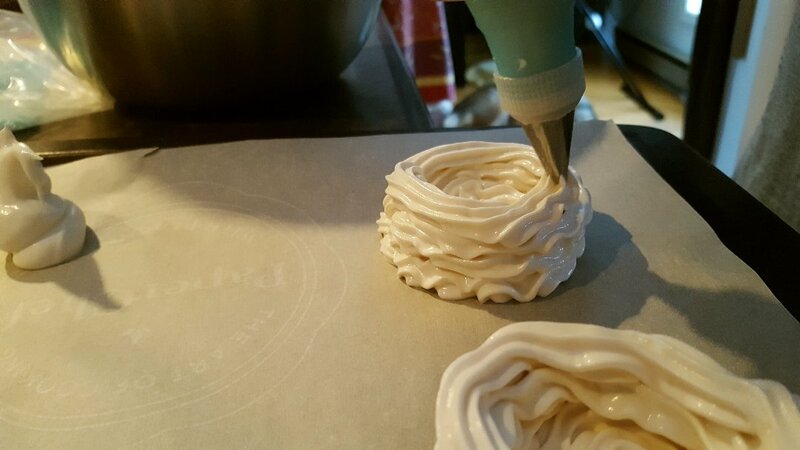 You have a real talent for creating tasty treats that are as pleasant to the eye as the palate. I'm taking a break during the holidays too. See you on the other side. Your Yule feast and Yule log both look magnificent! Have an amazing Holiday season there with Alex and all the pups! I’ve made pom poms before. They have a way of...exploding and all you’re left with is 200 pieces of little yarn. I will have to check your video to see if there is a better way. The Yule meat pie looks good; it's almost like Shepherd's Pie, minus a few ingredients. How comforting to eat such a dish. I was amazed to read about your Yule Log's five hour prep! Wowza! But I can see why since it's like a jellyroll made up of parts that have to be prepped separately and then combined together. Your brandy drink sounds good! I bet you have a full bar at home. Your Santa hat made me smile. I like how you have traditions. Thank you for your recent visit. You are sweet and uplifting. I am failing miserably at YOP. Sundays I feel is sometimes a bad day for me as I like to sew on that day and while I know I can include my sewing on YOP, I would rather keep them separate; yeah, I know I'm weird. Oh my Dear, I do want to come to visit you!!!! You do up holidays, in a super way. And have so much fun, doing it. Oh that Meat Pie! Gorgeous! And I especially love the name of it, in the French! Ice lanterns made with balloons. Instead of the box way. I've never done either but would so love to. Enjoy! Enjoy! Enjoy! The two of you! And the pets too. Take your time, without blogging interruptions. Happy, Happy, Happy Christmas! I LOVE your Yule log and the pie looks so good. So, those "mushrooms"--are those made with frosting or what? Looks divine. I am so happy for you that you have Alex there to help you discover the joys of this season in your OWN way! Yes, you and Alexandra def have similar backgrounds. ANY happy memories she has are the few times she got to be at her grandma's. In fact, I was so surprised to learn that not only did they not celebrate Thanksgiving, they only really did two Christmasses--both at Salvation army and never had a tree but then again, like your situ, being home wasn't great anyway. Needless to say though, similarly, Alex has come to love the season and loves everything about xmas as she alwasy loved the music and meaning anyway. P.S. That hat looks great on you. Well done! Rain, I always look forward to your posts. So much fun. So much joy. So much love! And so much good food :) I'm sorry for whatever pain the past holds and I'm really happy that you have created your own wonderful traditions to enjoy in the present. I know I've already thanked you but I will thank you again for the beautiful Christmas card. I can't tell you how much joy it brought me! It is on my desk where I can enjoy it every day. Tomorrow at noon my daughter arrives from Ottawa and she'll be here till Tuesday. And on Monday (hopefully the weather cooperates!!! ), the rest of my family will come over for lunch. I am really looking forward to it because it's the first time in years that I'll be hosting a get together for all of us. I wish you and Alex and all your fur babies a very joyous Christmas! Stay warm. Have fun. Enjoy! Glad you guys are having a good time, nothing like good food to celebrate with. Fun times. Oh my goodness, your meal looks wonderful! Love the pie and the cake! I've always wanted to make one of those. You are just too cute in your Christmas hat! Nothing better to help keep you warm too. What a lovely solstice meal and those Ice Lights are fantastic love them, have a good Christmas and I will catch up with you on the other side. Another uplifting and heartfelt post from you dear Rain. I'm so happy your Christmas - and obviously every day - have become happy and fulfilling times with Alex at your side. . . . . . the two of you are amazing as to what you get done tucked away there in the mountains! My late MIL was French-Canadian and used to teach me recipes such as the tourtiere when I was first married and didn't have a clue as to such delicacies. Of course, now being a non-meat eater (40 yrs. ), I don't eat them but do remember them well. Your Yule log is amazing - most elegant and I bet delicious. Enjoy each Christmas moment - and for me, meeting you this year via your blog, has been a wonderful thing. With love and wishes for a beautiful Christmas in the snow - stay warm and be happy. Same to you Rain! The hat and goodies look awesome! Oh my goodness... the food all looks so delicious. And festive! 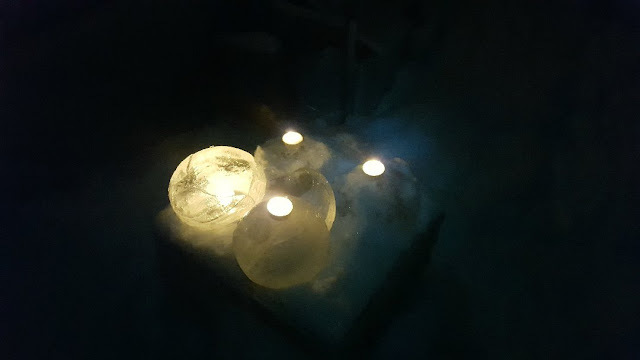 Ans your ice lanterns - so cool! 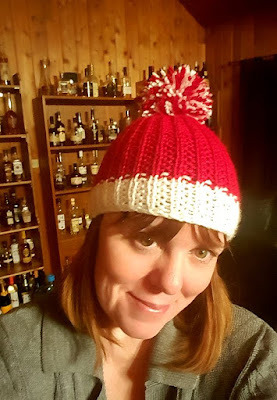 Your spur of the moment Christmas hat is gorgeous! It was truly -26 degrees? That just doesn't compute in my mind. Assuming that is Celsius, even if I convert it to Fahrenheit it's nearly unfathomable to me. We MIGHT dip close to -10 F once or twice in the depth of winter, but I'd sure not be outside to enjoy candlelight in those temps. lol But that's why your blog is so much fun. I get to come here and enjoy things that would likely never occur to me to do. I love your spirit, Rain. I hope your celebrations were (and are) all happy. Thanks Harry :)) I feel like I should make a hat for all occasions now lol...when I get an idea, it sometimes gets out of control. Oh a store bought hat is just fine too! :) I'm glad you're enjoying the food photos! Thank you Debra! :) Hope yours was fantastic!! Lol Birdie...my first pom pom DID explode...so I had to find a better way of doing it, I think the video is pretty good, if you do try it, take her advice about sharp scissors though...they help a LOT. Your tourtiere looks amazing!! My great aunt would make a bunch every Christmas and my dad would call it torture pie - I guess the spices she used didn't agree with his stomach! :) I love tourtiere. If I could only make proper pastry. Your Yule log!!! OMG!! Love! And your lights - I love this! Your hat is fun! 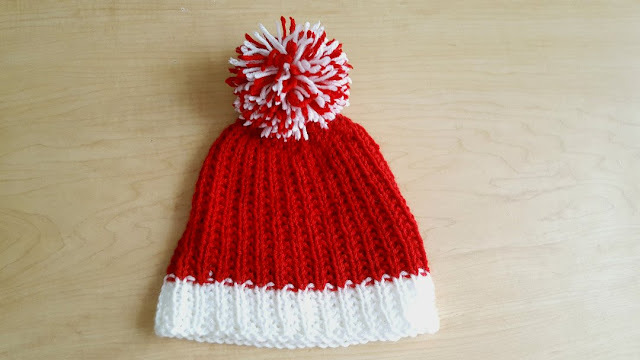 I would love to make a Christmas hat. Maybe next year! I have already started a Christmas 2018 notebook in my phone. I would like to be much better prepared for the holidays next year. For us, there is so much all in a row and with the added furballs this year, I was so behind! But I like your idea of a Christmas 2018 notebook, I'm going to do the same! !